When you think of tent-pole summer movies, you automatically think of big, loud, bombastic movies. And even if the movies are crap, you realize that big, loud, and bombastic is easy to do. Now, subtle...that is something else. We all have had that friend who thinks that they are slick and smooth, but they really aren't. It takes a lot of work to truly be subtle. Subtle can often be confused with uneventful, but they are two different things. There are plenty of movies which try so hard to be subtle that they forget to actually do anything. The Witch is a great example of a movie which is never loud, never bombastic, but delivers a very strong effect in the end. 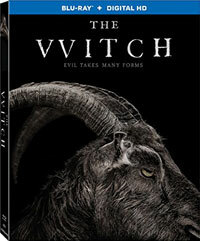 The Witch takes place in New England in the 17th Century. As the story opens, William (Ralph Ineson) and his family are being exiled from their village for an undisclosed offense. (The fact that William will not admit that he's wrong angers the elders.) So, William, his wife Katherine (Kate Dickie), their daughter Thomasin (Anya Taylor-Joy), their son Caleb (Harvey Scrimshaw), the twins Mercy (Ellie Grainger) & Jonas (Lucas Dawson), and baby Samuel (Axton Henry Dube & Athan Conrad Dube) strike out for the wilderness. We catch up with them some time later. William has been able to grow corn and amass plenty of firewood, but otherwise, the family has little to eat. Attempts at catching wildlife have failed and things are looking bleak. A tragedy convinces the family that a witch lives in the nearby woods. As they are a very devout and religious clan, this strikes fear in their hearts. As more and more bad things happen, paranoia and distrust grows in the family, as accusations of witchcraft begin to fly. First-time feature-film Writer/Director Robert Eggers has created a very interesting piece with The Witch. The movie was marketed as a horror film and some of the advertising contained blurbs which backed up this claim, but it really isn't. It's more of a dark drama, about 95% of which focuses on the family and their strife. Again, we never learn why they were ex-communicated from the village, and in the end, it isn't really important, save for the fact that William's pride was involved somehow. We see William, Thomasin, and Caleb work on the farm -- hunting, tending to the goats, taking in the corn -- while the twins ramble about creating chaos. The movie doesn't shove the bleakness of their existence in our face. Slowly, as the movie progresses, we learn that their situation is looking desperate as they try to find food. Not so subtle is the fact that Caleb is beginning to notice Thomasin's developing body. The most surprising thing about the family is that William is a level-headed and sensitive man. I was expecting him to be a Bible-thumping nut who lorded over his family, but we feel his genuine affection for his wife and kids and this really helps to make the film more accessible. Now, for the other 5% of the film. The supernatural elements of the film are handled in a very interesting way. The first unusual thing which happens is shot in a manner which is both suggestive and matter of fact (I know that doesn't make any sense, but it will when you see the scene), so that the audience is questioning the reality of what we are seeing. The second unusual scene focuses on a very harrowing event involving Caleb, that contains a moment which is the Colonial equivalent of the chest-burster scene from Alien. Again, this just happens and we are left to deal with the consequences. The finale truly embraces the supernatural aspects of the story, but it does so in a manner which reminded me of David Lynch in that the odd nature of what is occurring seamlessly blends with the more realistic scene which proceeds it, creating a step into insanity which feels quite normal, if you will. Eggers has made a movie which succeeds as a historical drama, but it weaves in the horror elements in a very precise way which is a refreshing change from the typical in-your-face scary movie. Based on some things which I'd read, I went into The Witch expecting the worst, as I've been burned many times by modern films. So, kudos to Eggers and his crew for not only creating a painstakingly accurate historical film, but a movie which deftly balances drama and the macabre. I never found the movie to be creepy, but the final scene is decidedly indelible. I had anticipated a slow, perhaps slow-burn at best movie, but the family's story keeps things moving along, as we experience the more abnormal scenes. I'd read comments about the dialogue as well. The film doesn't pull any punches with the 17th Century verbage, so be prepared to turn on the subtitles so that you can understand everything. In the end, patient viewers will find a movie which plays like an incredibly dark Halloween episode of Little House on the Prairie. The Witch convinced me to cancel my plans to have Thomasin babysit on Blu-ray Disc courtesy of Lionsgate. The film has been letterboxed at 1.66:1 (yes, you read that correctly) and the Disc contains an AVC 1080p HD transfer which runs at an average of 34 Mbps. The image is sharp and clear, as the daytime, exterior scenes look great, showing no grain and no defects from the source materials. The colors here look fantastic and the crispness of the image is admirable. For nighttime scenes, Eggers used minimal light sources, such as candlelight, and this has created some issues with the transfer, as some of these scenes show shimmering on the image, which is distracting. The Disc carries a DTS-HD Master Audio 5.1 track which runs at 48 kHz and an average of 3.6 Mbps. The track provides clear dialogue (sort of) and sound effects. As with the story, some of the audio effects are very subtle. However, key scenes in the forest and in the yard, are punctuated with stereo and surround sound effects which highlight sounds coming from off-screen. The finale provides notable subwoofer effects. The Witch Blu-ray Disc contains a few extra features. We begin with an AUDIO COMMENTARY by Writer/Director Robert Eggers. "The Witch: A Primal Folktale" (8 minutes) features interviews with Eggers, who explains his inspirations for the film, and the cast, who talk about their experiences. We get some on-set footage and stills here, along with a discussion of the production design and the costumes, as well as the historical relevance of the film. "Salem Panel Q&A with Cast and Crew" (28 minutes) was shot following a screening of the film in Salem and it features Eggers, Taylor Joy, Moderator Ted Baker, a professor at Salem State, Author & Historian Brunonia Barry, and Historian Richard Trask, who discuss the film and its historical accuracy. "Design Gallery" offers 16 examples of costume, character, and production design sketches and ideas.